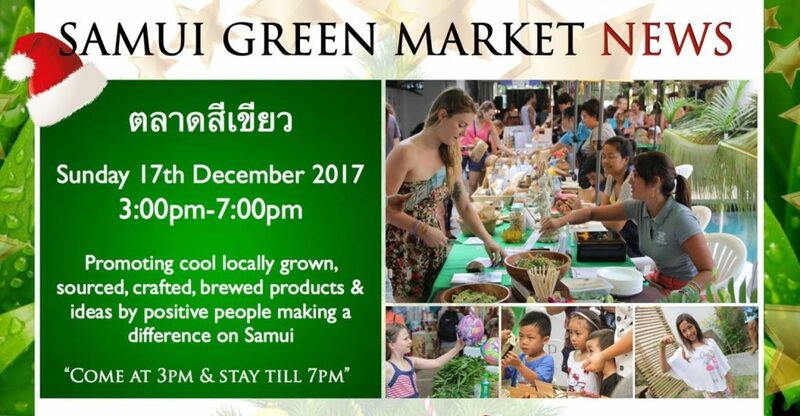 Samui Green Market – Xmas edition! Join us for this lovely afternoon of live music, pick up some great gifts for Xmas, raise a toast to some friends and support local caring people. We welcome children to bring crafts/ goods/ anything they’d like to sell. If you know of any, please book a table for them with us! We have asked our vendors to remember: NO PLASTIC BAGS/ PLASTIC STRAWS/ PLASTIC FOOD BOXES/ FOAM. This is a green market and YOU have the power to vote with your feet – ask vendors to use less plastic, don’t take a straw automatically, BRING YOUR OWN BASKET/ SHOPPING BAG. Let’s be part of the solution instead of pointing fingers! We look forward to having our old friends turn up for this great little regular Samui event. Funds raised will hopefully cover the musicians, and we will donate towards Rohingya refugees. Please support us with your shopping power, and drop a donation in the box if you like.